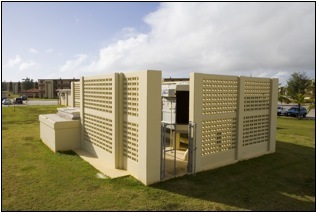 The project “USAF Chiller Plant Cooling Tower Replacement” located at Andersen Air Force Base Guam involved the complete replacement of three (3) existing cooling towers. The chiller plants new cooling towers served fifteen (15) building/structures for the Air Force. In this project, Black Construction Corporation acted as the prime subcontractor to Jacobs Engineering. The work included the demolition and installation of the three (3) cooling towers with 13,500 tons of refrigeration capacity, construction of typhoon wall enclosure, equipment foundations and beams. Site works included demolition of the existing cooling tower, clearing, grubbing, grading and landscaping.